Humanities students at The Sixth Form College, Solihull have been learning about Alexander the Great this week, thanks to visiting speaker TV presenter, historian and archaeologist, Michael Wood. A professor of Public History at the University of Manchester, Michael Wood is also a documentary film-maker and he made a documentary series for the BBC called “In the Footsteps of Alexander the Great” in 1998. Filming for this documentary saw him retrace the travels of Alexander the Great, from Vergina in Macedonia, through seventeen present-day countries to the borders of India and back to Mesopotamia. 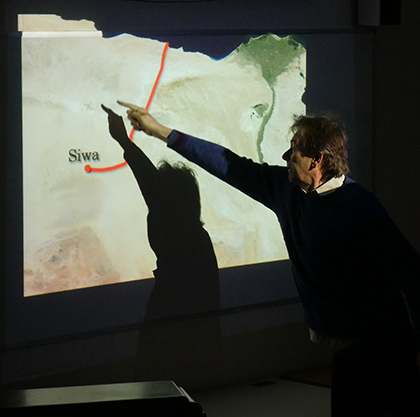 Students of a number of Humanities subjects attended the presentation to see Professor Wood’s photographs from this expedition and hear what he learned on his travels. The history of Alexander the Great, who reigned as King of the Ancient Greek kingdom of Macedonia from 336–323 BC, was particularly relevant to those students taking A level Ancient History and Classical Civilisation.